Hit that play button! More long recordings. 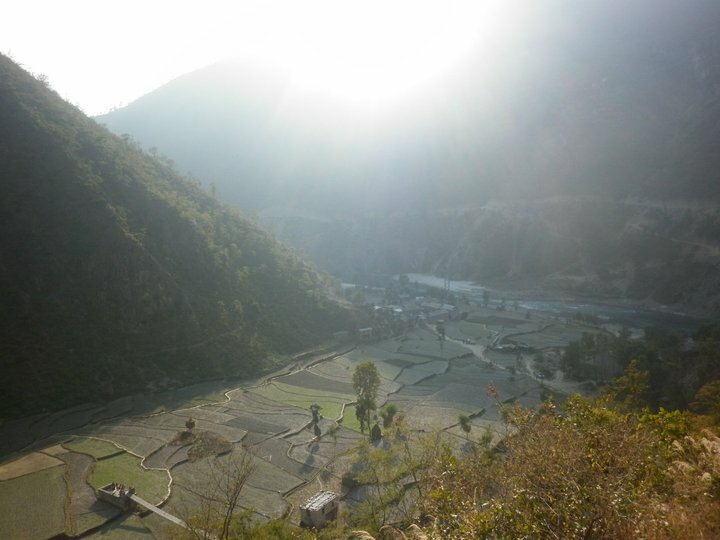 Yesterday was Christmas Eve (as is usually the case the day before Christmas) and my first day of trekking through the Nepalese Himalayas. It was very pleasant! More a casual stroll than a trek and we soon arrived in the village of Dongme, where we were to stay. Unfortunately, we weren’t treated to any performances or musicians whilst in this village but it was a memorable night none the less! Bee hive we found above the bed. Upon arrival we were divided into groups and shown to the rooms we were to be staying in around the local houses. 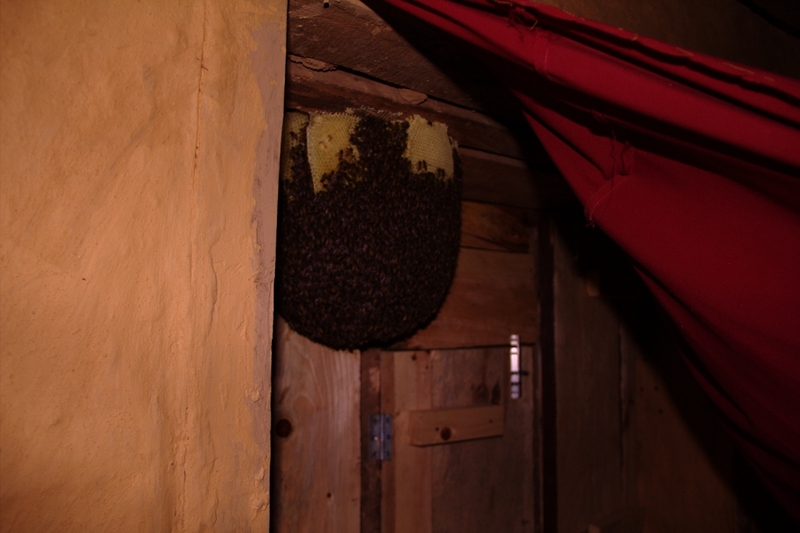 One of my fellow travellers entered his room to discover the bed he was to sleep in covered in bees. Hundreds of very slow moving, not flying, but not quite dead, bees. We figured the reason for the bees’ docility was the cold weather and began to investigate further. Eventually someone pulled aside the curtain just above the bed and, low and behold, there inside the window box was a huge bee hive (see picture above)! Covered in still bees, it hung unmoving like a ghostly temple frozen in time. Suffice it to say, my travelling companion slept else where that night. Later Christmas Eve, after a dinner of dal bhat, I walked up to the village stupa with a few friends to do some star gazing. Exploring the stupor, we found an image of Buddha housed in a small alcove, covered in Huntsmen spiders. There was one large spider, presumably the mother, and hundreds of small baby spiders. But, what was particularly odd, the spiders only positioned themselves on the image of Buddha. No where else, either inside the alcove or on the rest of the stupa, had a single spider on it! The rest of the evening we spent laying on the ground staring up at the stars, it was spectacular. If you’ve ever been to truly remote areas, away from city lights and pollution, you’ll understand what I mean. There are so many stars out there that you never usually see! The Milky Way appears as a huge blur of light smeared across the night sky and millions of stars extend deep into outer space. Very humbling stuff. About half an hour into our star gazing, we noticed something shining very brightly in the southern sky. It looked exactly like a star, although brighter and moving very fast. Not only was it moving at an incredible speed, it was moving erratically, zigzagging back and forth, as it traversed the night sky. I still have no idea what this object was. It was definitely not a plane, as it looked exactly like a star and was only a single colour (planes usually flash blue and red). I don’t think it was a satellite either, as we had already witnessed several satellites during our gazing and they tend to move much slower and stick to a straight path. This thing appeared tiny (ie. very far away!) and zigzagged its way directly above us, from one end of the sky to the other in a couple of minutes. I hate to use the term, UFO, but we couldn’t figure out what it was so it was definitely ‘unidentified’ by us! We lay there discussing life, the universe and everything for a while longer before the cold got the better of us and we made our way to bed. Early the next morning, before setting off on our second day of trekking, we returned to the stupor to watch the sun rise. The sun emerging over the horizon, reflected off the snow capped mountain peaks like burning hot lava, was equally spectacular. I say ‘hill’, it was, without a doubt, a huge mountain. But if you asked one of the locals they would tell you it was, ‘just a hill’, and ‘that’, pointing to a ridiculously ginormous mountain, ‘is a mountain’. That being said it didn’t really matter, we walked down hill for four straight hours which, you’ll know if you’ve ever walked down hill for an extended period of time, completely kills your ankles, calves, knees, thighs and back. You will hurt. And I hurt. My first view of Lubughat. Then, almost out of no where, the vegetation begins to thin and I can see out final destination, the Majhi village of Lubughat, and it is breath taking! I feel like Link from The Legend of Zelda, discovering a strange and beautiful new part of the world. It may seem all that more amazing due to the torturous four hours I’ve just experienced, but I don’t care. This place is magical. 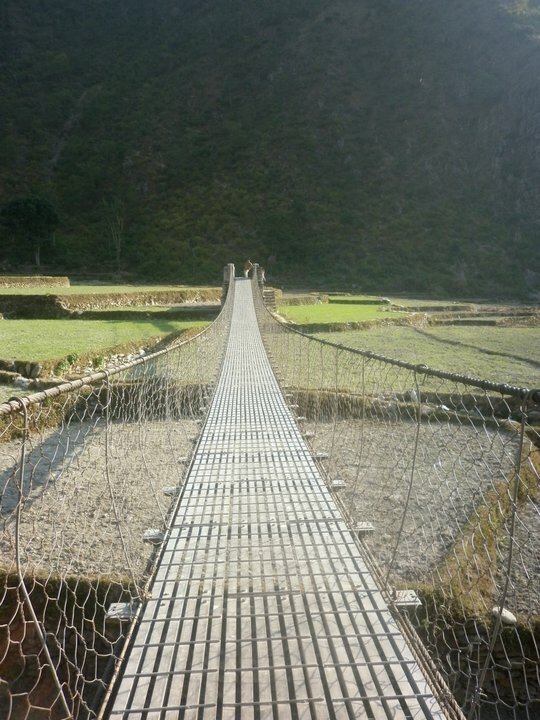 Suspension bridge leading into Lubughat. I’m suddenly filled with a new energy and begin to hurry down the final leg of the ‘hill’. Reaching the bottom, I cross the long suspension bridge that leads into the village (see picture to the left) and make my way over the rice fields towards the houses. As I pass by smiling locals working in the fields, I just can’t get past how beautiful this place is. Finally, I reach the village store to find a number of the group have already arrived and are enjoying some hot noodle soup. I am welcomed by the locals and given a khata, as is tradition, before I take a seat with my friends to discuss the evening to come. It seems we are to have a fish dinner (finally some meat!) and be treated to a special musical performance. Some more of the Village kids. One of the village kids, down by the river. The rest of the afternoon is spent exploring the village. I wander down to the river where a number of the local men are bathing and one of our group has also decided to jump in and clean himself up. The water is near freezing point so I decide against this course of action and wander over to a group of kids who have gathered around a fisherman. Using only a stick, line and a rock, he is catching our dinner for the night! Amazing enough already, but then some how he is able to do this despite the kids throwing and skimming rocks along the river, scaring off all the fish. The sun is starting to set now so I decide to head back to my lodge and prepare for the night ahead. Fisherman at the river, catching our dinner. Come night fall, after a delicious dinner of dal bhat (again…) and fish (yay! ), I make my way through the darkness to a small shelter, in a clearing where our performance is to take place. In the shelter, all seated on wooden benches around a huge table, we are each brought a small bowl made from leaves. Inside is more of the fish from dinner. I’m quite full already so I put mine to one side, hiding it away as to not offend the locals. They then proceed to bring each of us a metal cup which they fill shortly after with a cloudy white liquid. It’s home made rice whisky, raksi. We sit in the shelter for quite some time, sinking cup after cup of rocksy with the villagers. They seem to be a little more keen on it than I am and are starting to get quite drunk! Then the time comes to move out of the shelter and into the clearing for the performance. Setting up quickly, I place my Schoeps M/S pair on to my Manfrotto stand and raise it high into the cold night air. Many of the villagers are gathering around me now, looking keenly at my recording devices. In front of me a large number of villagers are standing in a semi circle waiting to sing for us. I place my stand in the middle of the arc they have formed, back just far enough as to roughly form 45 degree angles from the centre of the group to either end. The mics are raised fairly high up and angled down towards the villagers, thus keeping them on axis to the mic capsules. With this position I should achieve a spread of the singers across the full stereo field whilst not being overly direct sounding. Arc of singers with mic placed in centre. I love the honesty in this recording. It’s so raw, unrehearsed and full of joy, it just sounds beautiful. This is something you very rarely achieve when recording people in western culture, the pressure to perform seems to take over and nerves will always get the better of them, but not here. 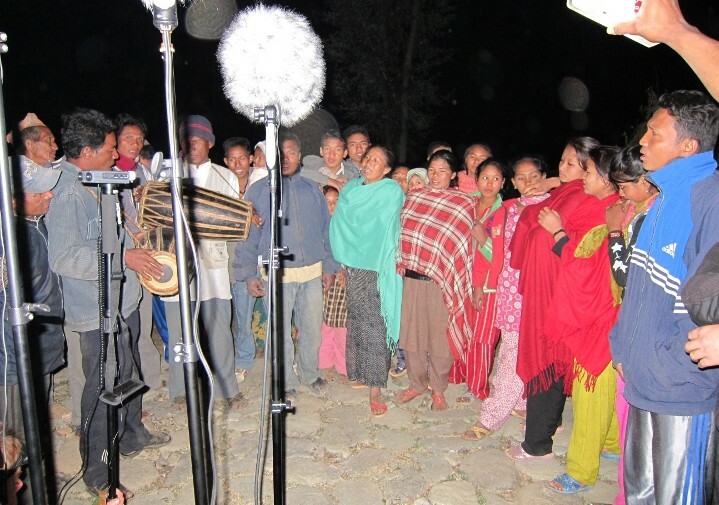 This is just a group of villagers singing their hearts out in the freezing cold night air. The drum isn’t too overpowering and the imaging came through wonderfully, you can almost see the individual faces. Unfortunately (Maybe? Maybe not…), a lot of the villagers move around or stop singing during the recording, so you get an unbalancing in the left to right image. 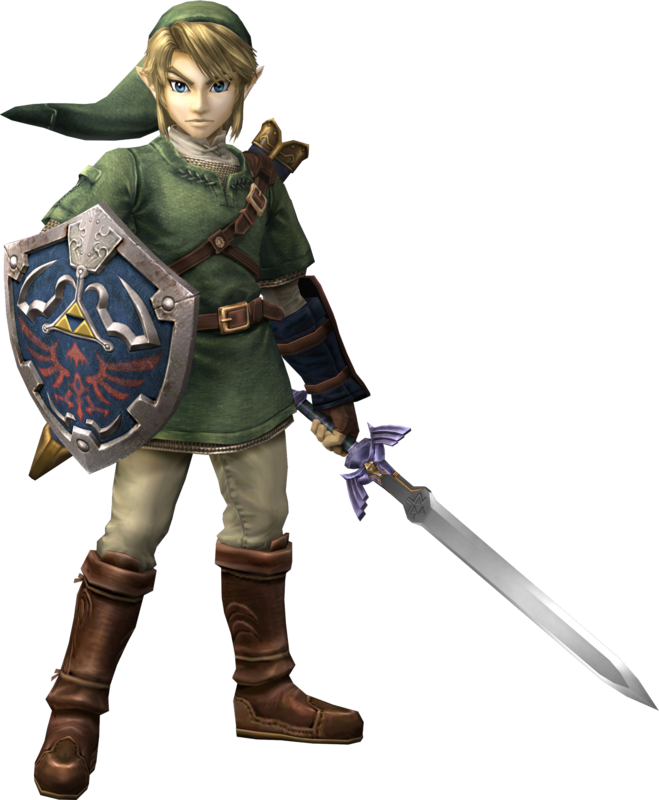 But that just adds to its rawness, so I don’t mind so much! …After almost 20 minutes of singing the song ends with one last “Ho!” and the villagers resume their general chatter. I look around to see smiles on the faces of everyone and cant help smiling myself. Then, from the corner of my eye I spot a group of half naked men crossing the clearing towards us. Not only half naked (in the freezing cold!) but also covered in mud, painted across their faces and bodies like war paint. They also happen to be wearing fake beards! It is easily one of the strangest sights I have seen in my life. It’s hard to really make out what is going on in this recording but I’ll do my best to describe it in all its hilarity! …The painted men and basket carrying women begin to dance around in a circle, in somewhat of a slowed down conga line rhythm, little kicks included (see very first picture). 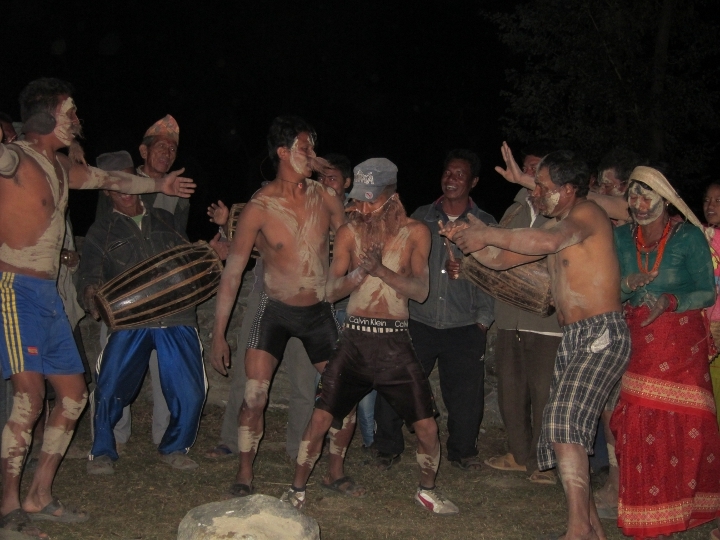 The other villagers all sing and clap around them and this goes on, for around ten minutes. One of the dancers come a little too close to my mic stand and give it a good hard kick, causing me to lunge forward and stop it from tumbling to the rocks below (this has been edited out of the above file). Then things start to take a rather odd turn. A few of the men break off from the rest of the group to retrieve a large rock from outside the arc and return to place it in the centre. They resuming dancing for a time when, suddenly, the man in the blue Puma cap (who also happens to have the most impressive beard) is set upon by his fellow war painted dancers. They take hold of him and try to lift him from the ground. Quite clearly the mightily bearded one isn’t overly keen on this idea and tries to resist them. He kicks up and thrashes about and it’s hard to tell if this is part of the performance or not! I look from side to side at my fellow travellers who gaze on looking as bewildered as I am. I look back to find the men have restrained their bearded superior and are carrying him over to the large rock they placed down earlier (see picture to the right). Lowering him down onto the rock he begins to struggle again. It reminds me, far too vividly, of times in high school when a gang of boys would take to putting another boy in one of the playground bins. But, eventually, they get him down on there as a number of the villagers burst out laughing around us. Basket women carying raksi filled leaf bowls. 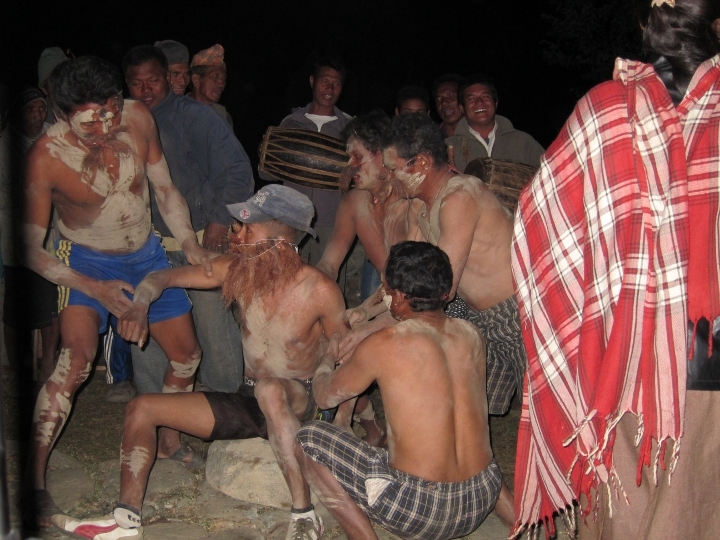 The performance continues on and the men begin to dance around their rock banished companion as one of the local women hands me a leaf bowl, filled with raksi. I accept it gracefully and sip on it slowly as they continue on. By this point things are starting to fall into chaos. The villagers are clearly drunk, no one is really singing any more, the dancers have stopped dancing and started drinking, and everyone has begun chatting away. Slowly it all fades away into the evening and I reach to my recorder and hit stop. – First there was a war. – The village won the war. – There was much celebrating. – The villagers wanted to put the King in a ‘special place’. – The King didn’t want to go. – They made him go. It didn’t take much to realise the King has been played by the blue hatted, overly bearded man and the ‘special place’ was played by the rock. I laughed and set off to bed. The next morning I awoke refreshed, legs a little stiff, but in high spirits. 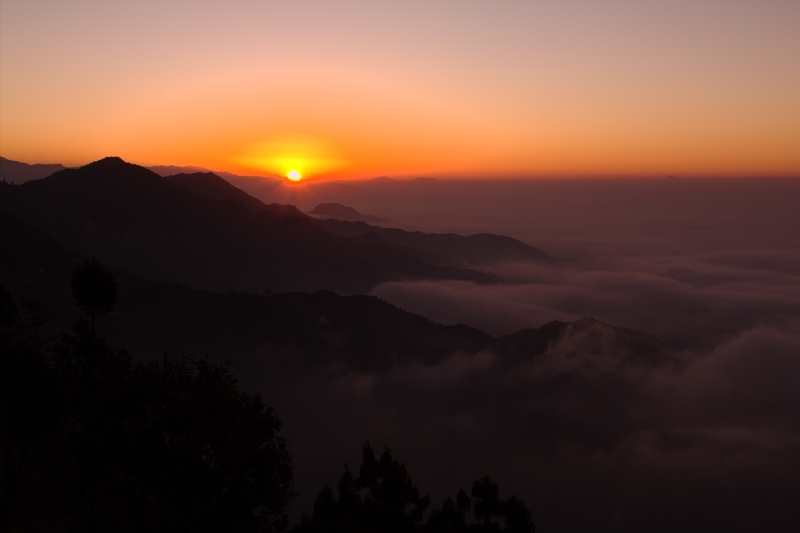 It had been a magical night and I was sorry to have to leave the town of Lubughat and head back to Kathmandu. My last view of Lubughat. As we crossed the large blue suspension bridge out of the Majhi village and began our final days trek, I turned back to take one last look at this tiny magical place. I smiled as one of the villagers caught up to me and began to tell me of his studies in English and history, he clearly either hadn’t been to bed yet or had hit the raksi pretty early on! But we walked on together as I laughed at his drunken ramblings and remembered the night that was. – All photos courtesy of Greg Simmons, Jarad Avnell, Elise Caldwell, Pia Herrera and me. – If you reached this point and actually read it all, well done! Awesome telling of the story of that night, that’s pretty much how I remembered it. It is so cool to read someone else’s impressions like this!